Victoria Beckham steps out in smart wide leg trousers ahead of her NYFW show | HELLO! September 11, 2016 - 15:22 BST hellomagazine.com Victoria Beckham looked smart and sophisticated ahead of her New York Fashion Week runway show on Sunday. Victoria Beckham looked smart and sophisticated ahead of her New York Fashion Week runway show on Sunday. The fashion designer showed off her signature muted style with a pair of wide leg navy trousers with white stripes and a tucked in navy shirt with white sleeves as she stepped out in New York City. The 42-year-old, who is currently keeping fans updated with the SS17 show through her Instagram account, accessorised her look with a pair of stilettos hidden under her flared trousers, an oversized white leather bag and a large pair of sunglasses while keeping her brunette locks loose and wavy. 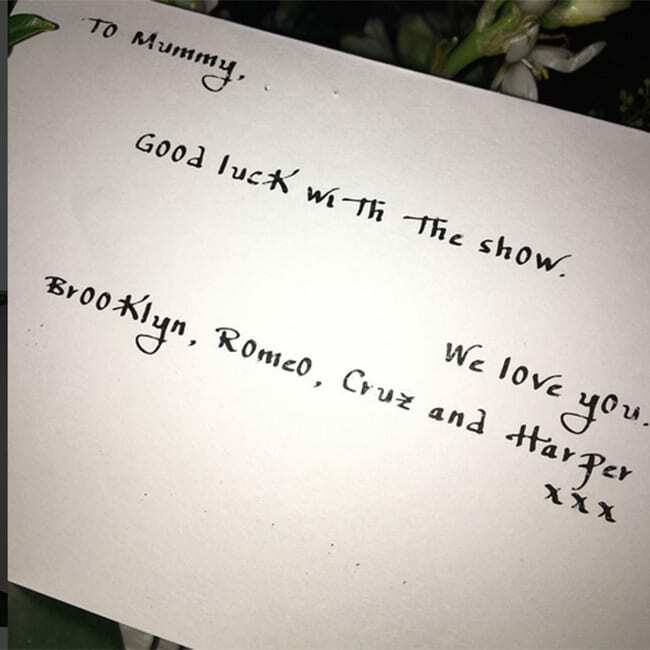 The mother-of-four seemed calm and collected before the show, and shared a snap of a bouquet of flowers and sweet message from her children, wishing her good luck for Sunday. The message read: "Dear mummy. Good luck with the fashion show, we love you," and was signed by Brooklyn, Romeo, Cruz and Harper. The star captioned the snap: "Feeling loved this morning. I love you @davidbeckham @brooklynbeckham X Kisses from NY." Victoria recently looked back on her style through the years in an open letter for Vogue magazine titled What I Wish I'd Known. She wrote: "You are going to have so much fun with your clothes – PVC catsuits; chokers that say absurd things; weird spiky blonde hair. It will never occur to you that you appear ridiculous.